This year, I decided to list a family favorite recipe from the blog (with any adaptions that we use regularly, if applicable) on the fourth Friday or Saturday of every month. This recipe will be one that we make quite often and that we all enjoy greatly. This post is the fifth Family Favorites recipe of 2018. This month's Family Favorite recipe is Gluten-Free Fruited Coffee Cake. It is essentially my Gluten-Free Mixed Berry Rhubarb Coffee Cake recipe, but you can decide what fruit you use. We love this coffee cake and we enjoy making it several times a year. We try to keep the fruit as seasonal as possible. That means that we normally make an apple version in the fall and winter, and a berry, cherry, rhubarb or combination version in the spring and summer. I want to try a pear and a peach version, and those are goals for when those are in season. I even want to do something with cranberries. The possibilities are endless! Did I mention that this recipe is wheat, nut and fish-free, and can be soy, egg and milk-free (if all your ingredients are)? Delicious and allergy-friendly to boot! What's not to love? Note: The gluten-free flour and baking mix I recommend do not technically contain soy, but the one contains xanthan gum and the other contains guar gum (see "Soy-Free" under variations for more details) which can cause issues for people with soy sensitivities or allergies, and that is why I will not claim that this recipe is soy-free. In a large bowl, stir together the 1 1/4 Cup white sugar, baking soda, salt and 2 Cups gluten-free flour blend or baking mix. Stir the eggs and sour cream or yogurt into the flour mixture until smooth. Fold the fruit into the batter just until evenly distributed. Scoop the batter into the prepared dish and spread evenly. In a smaller bowl, mix the brown sugar, 1/4 Cup gluten-free flour blend or baking mix, oats, cinnamon and salt (if using) until well-blended. Makes one 9x13 pan or anywhere from 12 to 24 servings, depending how big you want them. It is delicious warm or cold. I recommend storing any leftovers in the fridge. Milk-Free: Use a dairy-free yogurt or vegan sour cream for the sour cream or yogurt, and lard, coconut oil, or a dairy-free butter for the butter. Soy-Free: Neither Pamela's Gluten-Free All Purpose Flour or King Arthur Flour's Gluten-Free Baking Mix claim to contain soy, but Pamela's contains guar gum and King Arthur Flour's contains xanthan gum, which can cause issues with people who have soy sensitivities and allergies, and hence the reason I won't claim this recipe is soy-free already. You can use regular flour (if you can have it) or a soy-free, gluten-free flour of your choice. Keep in mind that if your blend doesn't contain guar gum or xanthan gum, you may need to add up to 1/2 teaspoon to 2 teaspoons of ground flax seed, guar gum or xanthan gum to help with textural issues. Also, you will need to make sure that all of your ingredients are soy-free. Other Yogurt Options: If you decided to use yogurt, but don't want to use vanilla, you can use plain or a flavored one, like strawberry, blueberry, honey, etc. This coffee cake is one that is always a hit wherever I take it. It is so versatile, good warm or cold, good for breakfast or dessert - I mean, is it any wonder it is a family favorite? I hope you will give it a try and that it becomes a family favorite for you, too! This is the fifth Recent Reflections post of 2018. Recent Reflections goes live the third Friday or Saturday of each month. Each Recent Reflections post covers something that I'm reflecting on. If you'd like to share a post with a similar theme, feel free to leave a comment with a link to your post, and I'll hop on over and leave a comment (and maybe some other readers will, too). This month, I will be reflecting on the power of prayer. Have you ever found yourself saying to someone, "I'm praying for you. I wish there was more I could do"? I have. We make prayer sound like it isn't much, like it's such a little thing. 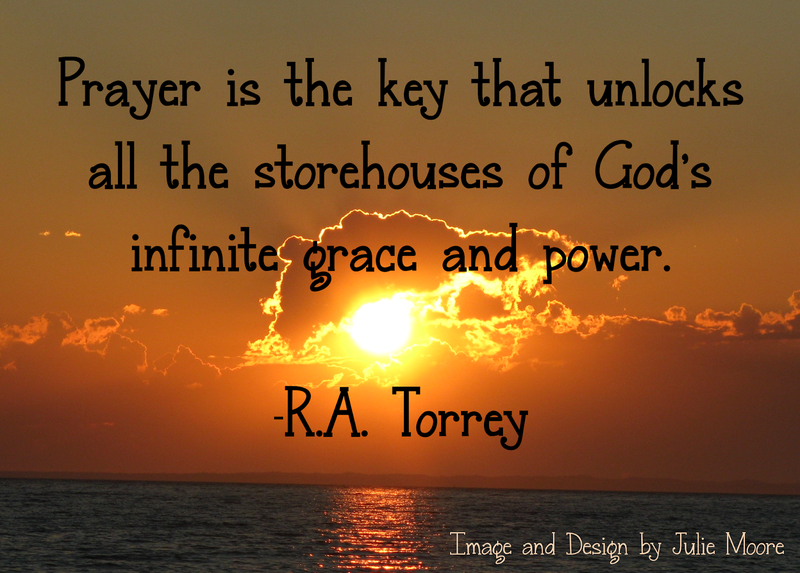 But let's really think about what prayer is: petitioning an almighty, all-knowing, everywhere-present God for His help. God is limitless and all-powerful. He has unlimited resources and knowledge. Tapping into that kind of help is not the least we can do; it is the BEST we can do. It amazes me how often we (read that as I) put Him in a box and act like, "Well, God, I've tried everything else. I guess I'll let You give it a go," like He's a feeble child instead of the holy Creator of the universe. We seem to forget that He can do ANYTHING...and we seldom truly believe He is capable. Ouch. The next time you're in a situation where you find yourself with prayer being the only way to help, be grateful. It means you won't louse it up because only God can do it so you have to keep your hands off of it. He is perfect, and if anyone can do something right, He can. As it says in 2 Samuel 22:31 (KJV), "As for God, his way is perfect; the word of the LORD is tried: he is a buckler to all them that trust in him." If you trust a situation with Him, you can know it will turn out for your best. It is my goal to always make prayer not the last resort, but the first response. I think a lot more would turn out right, and I know I would definitely have less worry, if I did this! May I always remember that God is able, and that I need to let Him do His job while I do mine - pray! I am also excited to share this new recipe with you! It is top 8 free (assuming all your ingredients are) and super simple to make! It takes half an hour or less to prepare, fills you up, and will feed the whole family well. It's a Tex-Mex-type dish that can be mildly spicy or extra spicy, depending on your personal preference. My whole family enjoys it equally, which says a lot since they don't always agree when it comes to Tex-Mex! If you're a fan of Tex-Mex, this may just be the recipe for you! Add the rice, stir, and bring the mixture to boiling again (Note: You want a rapid or hard boil.). Reduce the heat to medium or medium-low, cover and cook for 5 minutes. DO NOT STIR OR REMOVE THE LID! Different Broth: If you don't like chicken broth, you can use beef or vegetable broth. You could even use water, but the flavor will be more bland. Vegan/Vegetarian: Leave out the sausage and make sure your beans are vegetarian/vegan for a vegetarian version. Go a step further and use vegetable broth or water as well to make this recipe vegan. You could even use mushrooms instead of sausage. Different/Additional Meat: As I mentioned above, you can leave the sausage out or you could even use or add chicken, mushrooms, another type of sausage, or hamburger - whatever you fancy. As long as you don't overflow your skillet, you are good to go, though I recommend using no more than 2 lbs. worth of meat. More Heat: If you like it really spicy, you could even add jalapeños or another spicy pepper or peppers according to taste preference. Other Beans: You can use all the same type of kidney beans, sub black beans, white beans, pinto, red beans, or another favorite type of bean to this dish if you so desire (choose a type of bean that you'd use in chili, though, that doesn't have anything in it other than beans - you don't want baked beans or beans in a flavored sauce). You could even add up to 2 additional 16 oz. cans of beans if you desire and your skillet is big enough. Tasty, easy, and allergy-friendly to boot!